Disclaimer: I received a free entry into the Savannah Bridge Run because of my agreement to share footage I recorded during the race. 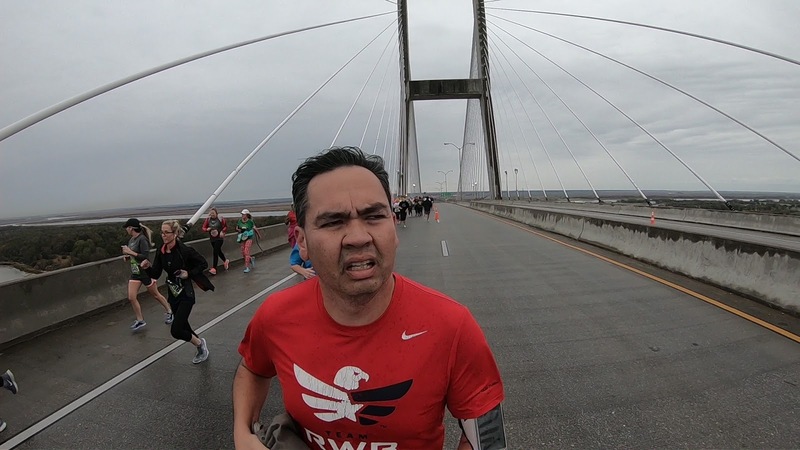 I first learned about the Savannah Bridge Run while I researched hotel accommodations for next year’s Cooper River Bridge Run. 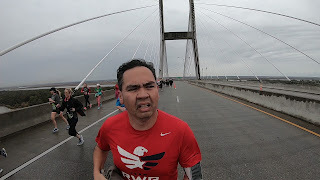 When Enmarket’s Savannah Bridge Run popped up during a search result, I dove deeper and learned quite a bit about “the South’s Toughest Bridge Run.” This particular race offered three distances: the 5k, the 10k, and “the double pump” which is a combination of the two for a total of 15 kilometers. The 5k race starts on Hutchinson Island and crosses the Talmadge Bridge in a north to south fashion before finish a block away from the Savannah Civic Center. The 10k starts at the Savannah Civic Center, goes across the bridge to the 5k start point and turns around to complete at the same finish line as the 5k. The Double Pump has participants run with the 5k crowd and then take off with the 10k people during the start time. Working with one of the organizers, I opted for the 5k race since the vast majority of the up-to 3,000 participants does that race. I guess going over the bridge once is enough for most people. As usual, I had my GoPro set up a week before the race. I studied the course map, looked at previous years’ results, and prepared my race attire for a balmy run. But as the week went on, a cold front took hold of my city and had me a little worried. I thought that if a cold front hit central South Carolina, what would take its place when it finally lifted? I checked the weather and from Columbia down to Savannah, meteorologists predicted warmth with some rain from Friday evening to Sunday afternoon. Each passing day, I looked at updated weather information for Savannah, and while prospects of delayed rain sounded good, I added my GoPro selfie stick to my gear list in case the weather worsened. We made our way down to Savannah Friday afternoon and had rain showers teasing us along the way. I almost got ran off the road by a moving rental truck because the driver didn’t pay attention while changing lanes; these were not good signs. We arrived at the Savannah Bridge Run expo with 40 minutes to spare, but from planning ahead earlier in the week, I asked a fellow Team Red White and Blue member to pick up our packets. She worked a booth for the Publix Savannah women’s half marathon & 5k and happily handed us our shirts, bibs, and safety pins. After checking into our hotel, I looked at the weather once again. This time, weathermen predicted the rain would hit the Savannah area at 7 AM. Up until that time, 7 AM on a Saturday, looked like 20% chance of rain with 90-100% happening after 1 PM. Great, I thought to myself, I really did not want to aim the GoPro at myself the whole race. But that is the only rain-proof set up I have for my GoPro. Now, the Enmarket Savannah Bridge Run uses an app to push out information in addition to having a dedicated website. According to both, 5k participants were highly encouraged to park at the Savannah International Trade and Convention Center, located right next to the 5k starting line. Trolleys would bring people from the finish line back to their original spots. Since we left our daughters back at the hotel, I parked near the Civic Center and we caught a race trolley up to the starting line assembly area. At the starting line, I saw a plethora of ruckers, quite a few costumed individuals and families, a handful of Team Red White and Blue shirts and apparel, and many, many people gathering around and talking. I almost felt like I was back in Charleston for their Bridge Run. The race announcer came on the speaker systems several times to put out information and one of the biggest for everyone out there was that runners should form up on the left side of the start line and walkers should go to the right side. We were supposed to start at 8 AM for the 5k race. Here is where I tip my hat to the race organizers; the last race trolley carrying runners from the main land got stuck in traffic and they didn’t want the runners to miss out, so the race organizers held off the start by almost 15 minutes. I believe this to be a good decision on their part. There may have been almost 2500 people already at the start line, but that last bus of about 40 people would have missed out on an electrifying time. No one complained or booed when the announcer explained why the race didn’t start on time. As per usual, I make my way to the very back of the crowd before the race started. I really need to gauge crowds better, because once the race officially started, it took me three full minutes to cross the actual start line. AC/DC’s “Thunderstuck” played at the signal of the race start, and it sounded almost done once I had room to run. I’m not fast anymore, but according to Strava, it took me 10 and a half minutes to complete my first mile, mostly from being around the back crowds. But I still had fun because I knew I couldn’t compete with the likes of sprinters, fitness fanatics, professional runners, and people still in the military. I will say that my mile times throughout the race got better as I moved past people and as the crowds thinned out. Near the 1st mile mark. Still crowded but thining. That first mile may have been very crowded, but it didn’t have the huge incline. The second mile contained all of the bridge, and while the top of the bridge was only 100 feet higher than the rest of the ground, that incline got to a lot of people. I thoroughly enjoyed it though, which is surprising because that incline is a steeper angle than what takes place in Charleston. 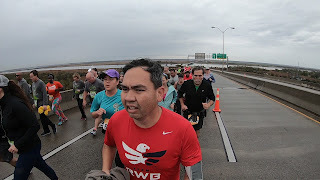 Once I crested the top of the bridge, that steep incline gave way to a steep decline, but I still ran with a relatively smooth pace or at least what felt like a good pace. During my time on the bridge, I paid sharp attention to the traffic. Everyone running in the race stayed in the marked-off right lane of the right side of the bridge, with the left lane of the right side of the bridge allocated for traffic going the same way as us. The left side of the bridge had two lanes open for oncoming traffic. I wish the right side of the bridge was completely shut down for just pedestrians and vehicle traffic restricted to the left side of the bridge. This thought came to mind as a semi-trailer rolled past a bunch of us and we breathed in its exhaust. Fortunately, that was the only big vehicle going past us during the race. The third mile occurred during the off-ramp and contained the one other incline for the race, something that mentally caught me off-guard. But that was uneventful and my third mile time jumped back to a somewhat normal 8:30ish mile time. 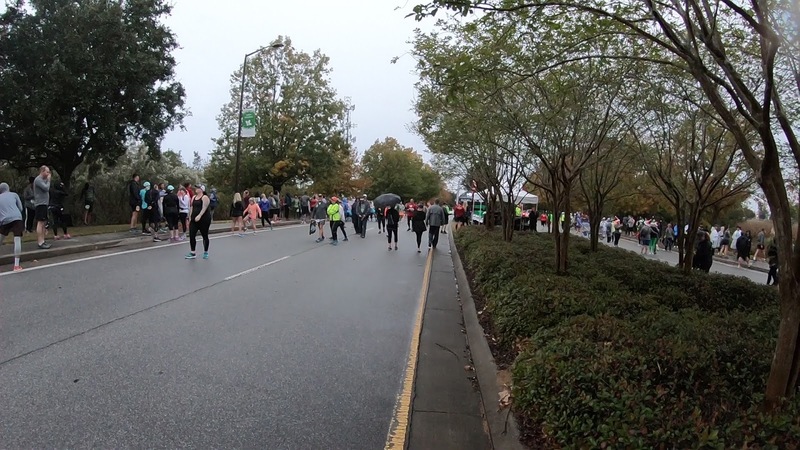 As I neared the finish area, I saw a supportive crowd behind pedestrian gates. I rounded that corner and saw the finish line, got my finisher’s medal after crossing and looked for a bottle of water. The overall atmosphere at the finish line felt festive. One of the biggest things I think about when it comes to a race is water station placement. I am used to water stations near mile markers or at easily accessible spots along the course. This course had two stations: one around the .4 mile mark and again at the 2.7 mile mark. 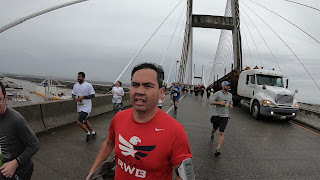 I presume the organizers placed the water stations before and after the bridge due to space limitations on the bridge itself, but I know I was not the only one who would have enjoyed a refreshing drink after running a mile. I found the water table after the finish line and two different size water bottles were offered to finishers. I also got to eat some fruit; there was no shortage of bananas, much to my delight. The medal itself looks very nice and I’m quite impressed with the weight, feel, style, and overall composition of the bridge medal. The long sleeve race shirt is a thin Delta Dri shirt and will definitely be worn in cool weather while I’m running. Other than the weird water station placements and traffic driving in the lane next to us on the bridge, this was definitely a nice experience and something I recommend to anyone who would be in the Savannah area in early December. 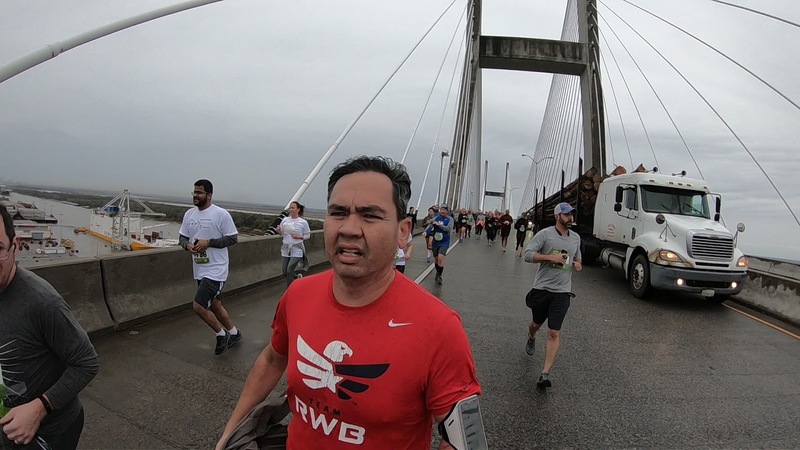 Walking or running over the Savannah River on the Talmadge Bridge is not something that can not normally be done unlike the Ravenel Bridge in Charleston. So when an event like this happens, that is your ticket to conquer this particular bridge.